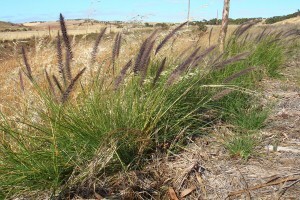 Fountain Grass and Feather-top Grass are two Pennisetum species that have become invasive weeds on Lower Eyre Peninsula. These grass weeds mainly spread along roadsides, but have spread into adjoining properties, into remnant vegetation and grasslands making control difficult. This project has enabled the LEPMG to control Pennisetum species on 180 hectares of roadsides on Lower EP. Through these actions it has removed the threat of Pennisetum grasses escaping into important areas of remnant vegetation and along the Tod River. See our Pennisetum control map here. Spraying with herbicide is the most successful and easiest way to control Fountain and Feather-top Grass, when the plant is actively growing. Through articles in the local newspaper, our website and weed swap events, we will continue to raise community awareness and get people thinking before purchasing plants at the local nursery, as weeds can jump the garden fence! Christmas Tree Giveaway this Friday the 13th! !